Back in 1920 this theater began its life with the performance Sin, staged based on Vynnychenko’s play. The period of renewed interest in psychological and intellectual drama of the Ukrainian classic was observed in the Ivan Franko Theater in the 1990s. Theatergoers remember the extraordinary staging of Andrii Zholdak – the play Moment. Later the premiere of the play Sin staged by Volodymyr Opanasenko took place there. Two years ago the first interpretation of the play Way to Beauty was implemented on the small stage (Lobby Theater) by Kateryna Chepura. 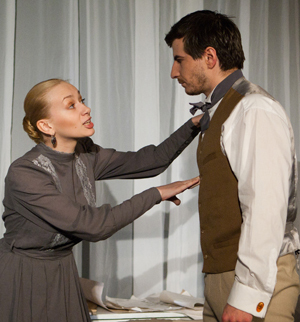 Today another play called Natus by Vynnychenko is staged by Chepura. The director involved young actors in work on this play and together they explored the subject of family relations. The events that take place in the play Natus (1912) – it is the name of the main character’s little son – are relevant today as well. The situation of Natus’s (part acted by Andrii Haidai) parents Roman (played by Dmytro Rybalevsky) and Khrystia (played by Vira Zinievich) is familiar: the feeling of love has faded away from the marriage and only a habit and mutual resentment remained. Khrystia’s complaints to her husband turned her into a quarrelsome fury, who is running around the place and is shouting threats to her silent husband. Both the man and his wife drifted apart and are living for their own interests. The only light link in the chain of family problems is their little son Natus. However, while the father loves him devotedly, the mother uses the child’s love to stroke her ego and to hurt her husband. Director Chepura (also set designer and costume designer) settled the stage space of the Lobby Theater in such a way that the audience is as if in the living room of the Vozii’s family and is closely watching the situations experienced by the characters. The play can be viewed as a guide for young married men who find themselves facing the need to choose between their beloved new wife and their own child.